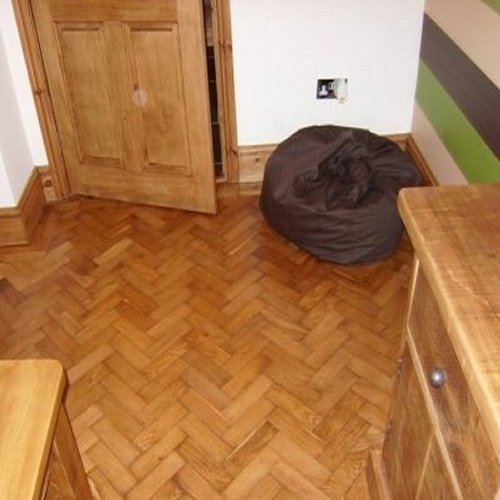 A classic solid hardwood floor, parquet wood block flooring can be fitted in a variety of designs - parquet herringbone design with a two block perimeter border, a simple half brick bond or basketweave design. Supplied unfinished, the parquet woodblocks must be fully adhered to the subfloor with a suitable adhesive such as the Rewmar MS Polymer adhesive, then fully sanded and finished with either a hardwax oil or lacquer. Available in a variety of wood species, grades and sizes, solid wood parquet flooring offers a classical looking floor suitable for any home.